All your NYC sightseeing is covered with this awesome land & sky combo! Combine extensive New York City sightseeing at street-level with both a ferry ride and a bird’s eye view of the Big Apple with this exclusive saver combo. We have combined a 48-hour hop-on, hop-off tour with a 12-15 minute helicopter tour, essentially taking care of all your NYC sightseeing needs with one product! Discover New York at your own pace with the Hop-On, Hop-Off Tour. 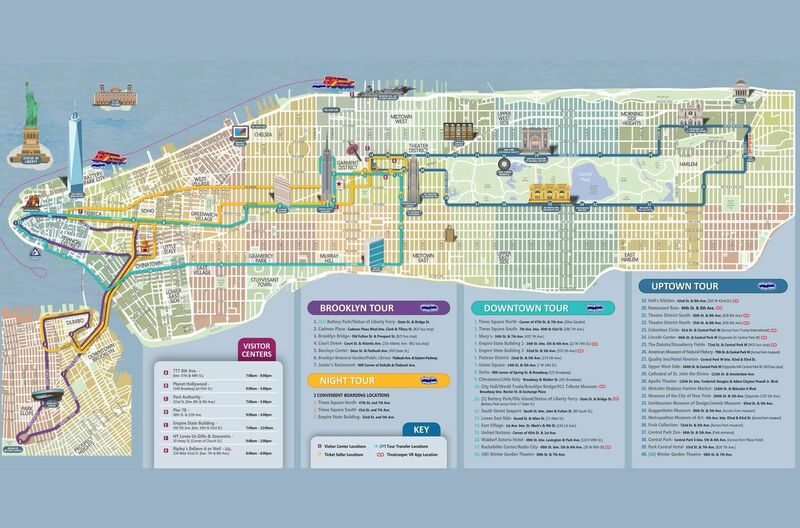 The tour has four routes: Downtown, Uptown, Brooklyn, and an Escorted Night Tour. These 4 routes have more than 50 stops and ensure that all the major New York highlights are covered. Plus, you also get a FREE ticket for the City Sightseeing Hop on Hop Off ferry and entrance to either the Museum of the City of New York or the New York Historical Society Museum! With your ticket, you can hop on and off these routes as much as you wish during a 48-hour period. Frequent departures mean that your valuable New York sightseeing time will not be wasted waiting for the next bus. While on the bus, an English-speaking official New York tour guide will ensure you don’t miss a thing. The recorded tour content and narration is enhanced with music and sound effects, mimicking the street sounds of NYC. You can also opt for a VIP Pass, which allows priority boarding at all stops on the bus and cruise routes. Plus, on your included Helicopter Tour, you will fly above iconic landmarks, such as the Empire State Building, the Statue of Liberty, and the Chrysler building. Soar over New York Harbor, the George Washington Bridge, and get wonderful views of the world-renowned Central Park. Taking a helicopter ride is one of the best things to do in New York if you want to see it all! The Hop-On, Hop-Off Tour operates daily. The Helicopter Tour operates daily, except Sunday. Hop-On, Hop-Off Tour: Buses run between 8:00am and 9:00pm You will be able to collect a timetable which shows the times for all lines and attractions when you redeem your voucher. Since this is an outdoor activity, schedules might just change sometimes check the frequency and bus operating hours on the day of your tour just to be safe. Helicopter Tour: Flights are available from 9:00am to 6:00pm. You can either give your preferred start time in the special requests field at the time of booking or call the operator on arrival in New York to plan your time slot. Hop-On, Hop-Off Tour vouchers must be exchanged at 777 8th Avenue, between 47th and 48th Streets. Once you have exchanged your voucher at the Gray Line CitySightseeing New York Visitor Centre, you can board the double-decker bus from any of the stops. The Helicopter Tour starts from Downtown Manhattan Heliport at 6 East River Piers, NY 10004. Downtown Tour: View the most famous neighborhoods, attractions, and places of interest, such as the Empire State Building, Greenwich Village, SoHo, Little Italy, Chinatown, World Trade Center site, Battery Park (departure point for Statue of Liberty/Ellis Island ferry), South Street Seaport, Times Square, Rockefeller Plaza, Radio City, United Nations, Fifth Avenue, and more. Uptown Tour: Stops include Central Park, Lincoln Center, Theater District, Fifth Avenue, American Museum of Natural History, Cathedral of St. John the Divine, Apollo Theatre and Harlem, Metropolitan Museum of Art, Guggenheim and other famous cultural attractions on Museum Mile, and more. Brooklyn Tour: Enjoy wonderful views of the Manhattan skyline and Brooklyn Bridge from historic Fulton Ferry Landing, great cultural institutions including the Brooklyn Academy of Music, Brooklyn Museum of Art and Botanic Garden. You will also see Brooklyn Promenade/Cadman Plaza, Atlantic Avenue, Barclays Centre, Brooklyn Public Library, Grand Army Plaza, Old Fulton Landing, and Fort Green Park. City Sightseeing New York® Hop-On, Hop-Off Sightseeing Ferry: Experience magical views of New York City's famous skyline while enjoying the convenience of four stops. This Hop-on, Hop-off Ferry Tour is the fun, friendly, and most convenient way to see the harbor that made New York City what it is today! Learn about the city with guided tour commentary while travelling from stop to stop. Night Tour: View the bright lights of the big city on this escorted evening tour. Treat yourself to unforgettable views of the lit marquees in the Theater District as well as the light displays at the top of the Empire State Building and the new One World Trade Center. After passing through Chinatown, Little Italy, and into Brooklyn, experience the spectacular views of the illuminated skyline and its sparkling reflection along the East River. You will also get a free Museum Ticket, which is only valid for entrance into the Museum of the City of New York OR the New York Historical Society Museum. To complete this fantastic package, you will also get an Eat and Play Card that offers a great range of savings at Manhattan’s best-loved restaurants, shops and attractions – meaning you save even more money! Each card is valid for up to 4 people. Optional VIP Pass: Be a real VIP with Gray Line CitySightseeing New York VIP all access pass! This pass allows priority boarding at all stops on the double-decker busses and CitySightseeing New York Cruises. There will be a separate line for boarding which could also be at the front of the bus. That’s not all! You will also enjoy a variety of discounts and special privileges at participating restaurants and retails stores. Also, included is an insert identifying all stops and discounts. This incredible New York helicopter tour departs from the Downtown Manhattan Heliport. There is nothing quite like the magnificence of the Big Apple as seen from a helicopter. This exhilarating helicopter ride takes you all over Manhattan, giving you a bird’s eye view of some of the iconic buildings. You will fly past America’s most famous landmark: The Statue of Liberty. Soar above Ellis Island and the beautiful New York Harbor. Your route will take you over the new Freedom Tower and the financial capital of the world, Manhattan’s Financial District. You will then fly over Midtown where you will see the Empire State, Chrysler, Woolworth, and Met Life (Pan Am) Buildings. Finally, catch a glimpse of the George Washington Bridge before taking in the green expanse of the world-renowned Central Park. Your thrilling helicopter tour ends at the Downtown Heliport. Voucher Information : Sorry, but we will need you to print a paper version of your booking voucher (we're working on changing this ). At this time no refund can be given for customers without a printed copy of their voucher.The Night Tour is not Hop-On, Hop-Off. During the holiday season the Night tour will be replaced by a "Light of the Holiday" tour (1.5 hours), featuring animated window displays & holiday decorations at New York's famous department stores, the giant tree at Rockefeller Center, and Manhattan’s other unique sights during the holidays. The New-York Historical Society Museum is closed on Mondays. On New Year’s Eve, the last bus will leave at 3:00 p.m. The Night Tour will not operate on New Year’s Eve. For the Helicopter Tour, Please call the local operator to book your exact time slot. We do not set this for you to give you the freedom to arrange this around your other plans, weather, etc. All passengers on helicopter tour must carry a photo identity card, such as a passport or driver’s license. Max capacity of a helicopter is 6 passengers and 1 pilot. Children under 2 years of age AND under 35 lbs. fly for free when sitting on an adults lap.